Baked goods are my weakness. I love them. It doesn’t matter how long you’ve baked, or how much you’ve baked – everyone has their disasters. Some are recipe failures, some are cook failures, most are some combination of both. I was attempting to make a snickerdoodle bundt cake (I know, right?!) and I pulled it out of the oven – beautifully browned, clean toothpick – only to invert it and have it completely fall apart. Apparently the only part of the cake that was actually done was the part I stuck my toothpick in. 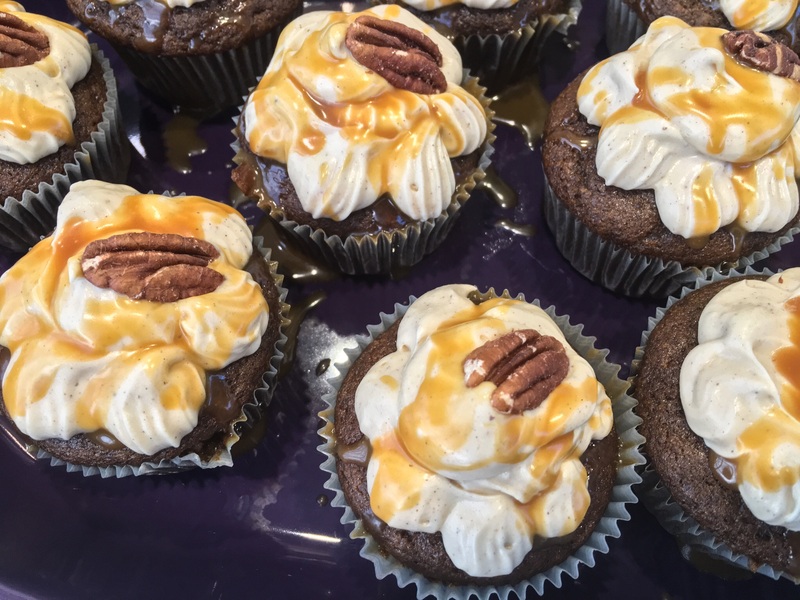 But I had pitted 2 cups of dates for that bad boy (note to self: pitted dates are worth the extra cash) AND added some salted caramel sauce (or, you know, insult to injury.) I was not about to let my work go to waste. So, I spread the cake (about 1/4 of it done, the rest goo) onto a cookie sheet and baked it flat. And baked and baked and finally (about 40 minutes later) I had an incredibly moist but ugly sheet cake. 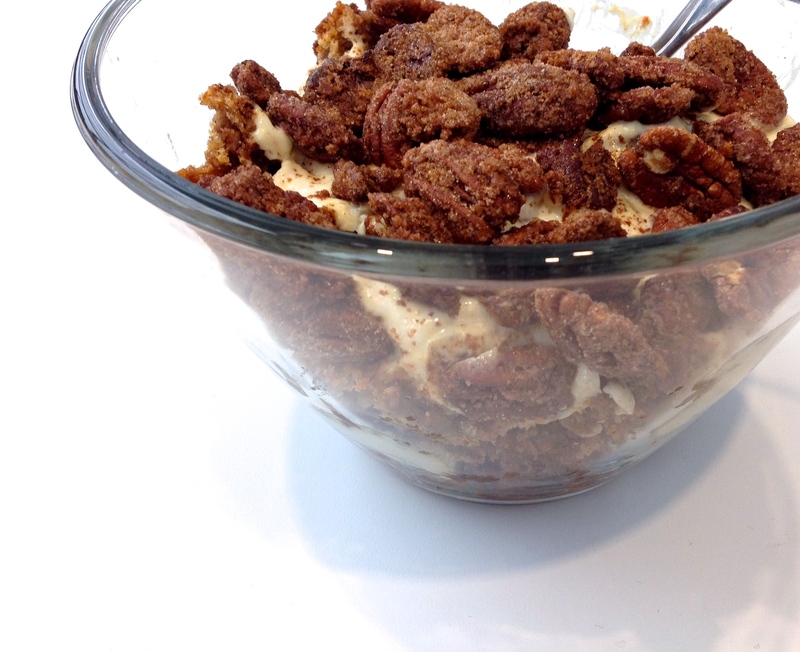 Which I then crumbled up with salted caramel honey Greek yogurt and candied pecans. Turns out, this was one of the best things I’ve ever done. It was delicious, relatively light and just this side of absolutely addicting. Layer of cake, layer of creamy, layer of crunchy/sweet – dessert is done! This is less about a recipe and more about a method. I’ll tell you what I did here, but honestly, you could take any cake (or muffin – breakfast trifle anyone? ), any kind of filling (Greek yogurt was actually really good, pudding would be delightful) and some kind of fruit or nut (those pecans will change your life), layer it up in a clear bowl and shazam! You have dessert. I’m a big brunch fan. It’s all the best parts of breakfast – eggs, bread, something sweet – except you also get sleeping in, boozy coffee and mimosas. Also, friends. Often, I’m cooking for a crowd the morning after a party and want something to feed everyone that doesn’t use every pan in the kitchen. This is it – you mix it up the night before (even before the party), let it sit and just pop it in the oven the next day. Which is a perfect amount of time to get a half an hour more sleep and still pour mimosas. 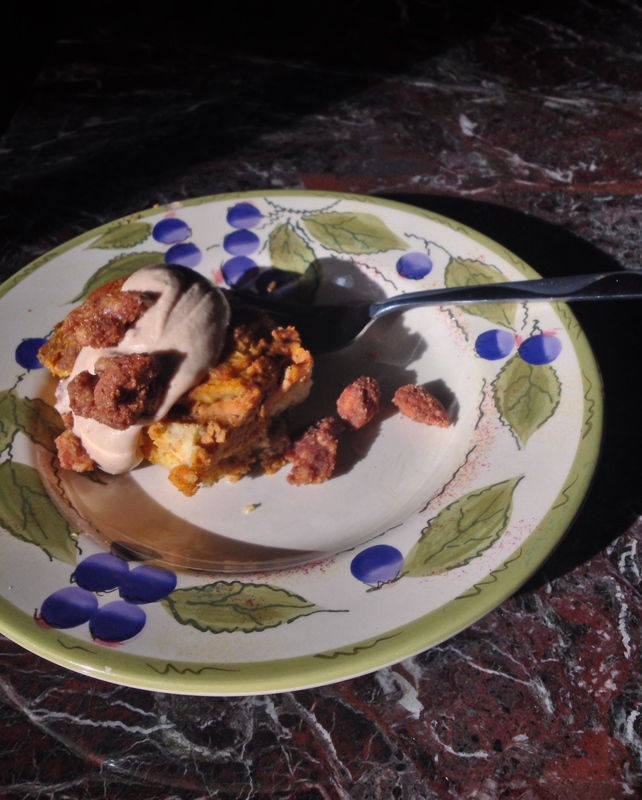 Pumpkin breakfast bake, topped with candied pecans. 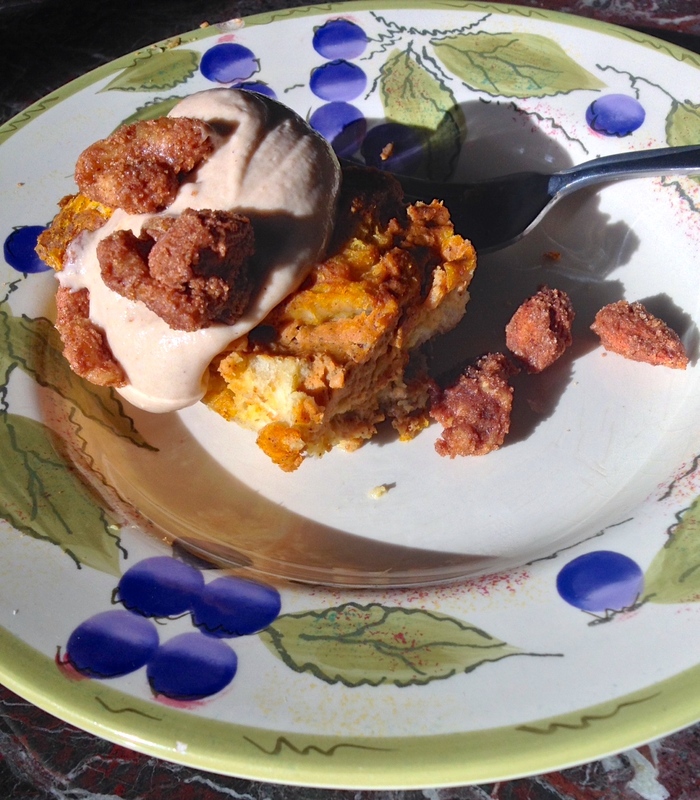 Pumpkin breakfast bake may be hearty and filling, but it’s also cheap and pretty healthy. It tastes like pumpkin pie, but with whole wheat bread, skim milk and little added fat or sugar, it’s a lot better for everyone. Which is good, because then we can feel less bad about last night’s pizza binge. Pumpkin breakfast bake – the perfect brunch for any table. Whisk eggs, milk, spices and pumpkin in a large bowl until smooth. Add bread and stir to coat. Place in greased 9 x 13 pan and cover. Refrigerate overnight. In the morning, uncover pan and bake in a 375 degree oven for 45 minutes to an hour, until the middle is heated through. 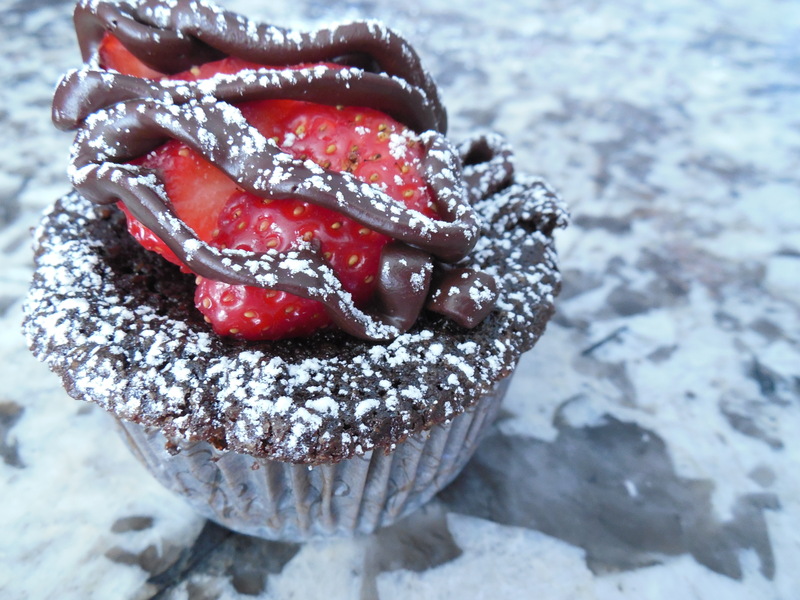 For the topping, just mix all four ingredients with an electric mixer until smooth. I adore pumpkin pie, and though we’ve been blessed with unseasonably warm Fall (thanks Mother Nature, but holy migraines), I’ve still managed to crave a slice. These? These are like, way cooler. Everything you love about a pumpkin pie, but better. Not the cloyingly sweet, overdone pie you might be used to, these guys are a great balance of sweet, spiced and savory. 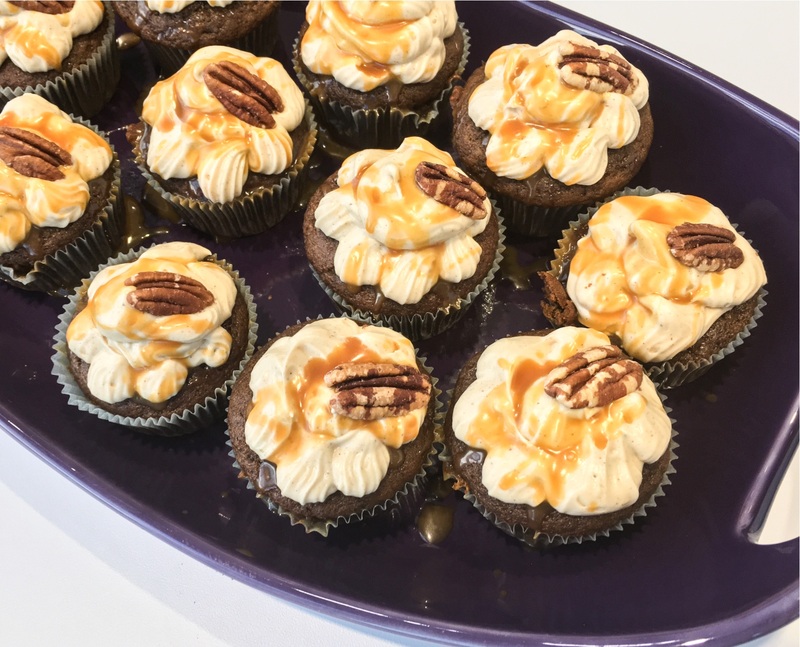 The frosting adds a great sweet/salt/tart balance, and the roasted pecan leaves everyone’s mouth happy. So, so many great recipes were technically ‘ahead’ of these guys in the pack – but you guys, I just can’t help it. 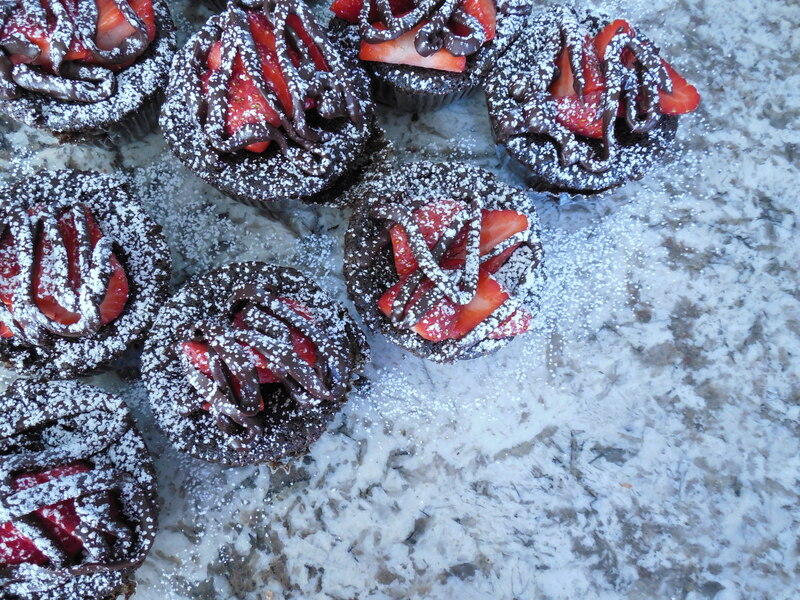 The sooner I tell you about these adorable little confections, the sooner you can make them. And eat them. And impress your spouse, neighbors or, in my case, vice president, with them. Because you will. You will have people clamoring for the recipe and praising you to high heaven and with two months before Thanksgiving, you’ll have so many chances to make them. I urge you to start now. Mini pumpkin pie – so cute and not too sweet! Grease a cupcake pan (really, really well) and preheat the oven to 375. Mix together everything else until smooth. Using a ¼ cup measure, fill each well and bake for 20-25 minutes, until set. Cool for 5-10 minutes in the pan, then cool on counter and refrigerate. Note: Unless you have more than one cupcake pan, you’ll do this three times. The last time, four wells will be without a crust. If that bothers you, you can open another can, but they’re good crustless, too. Beat ingredients together with a mixer until smooth. 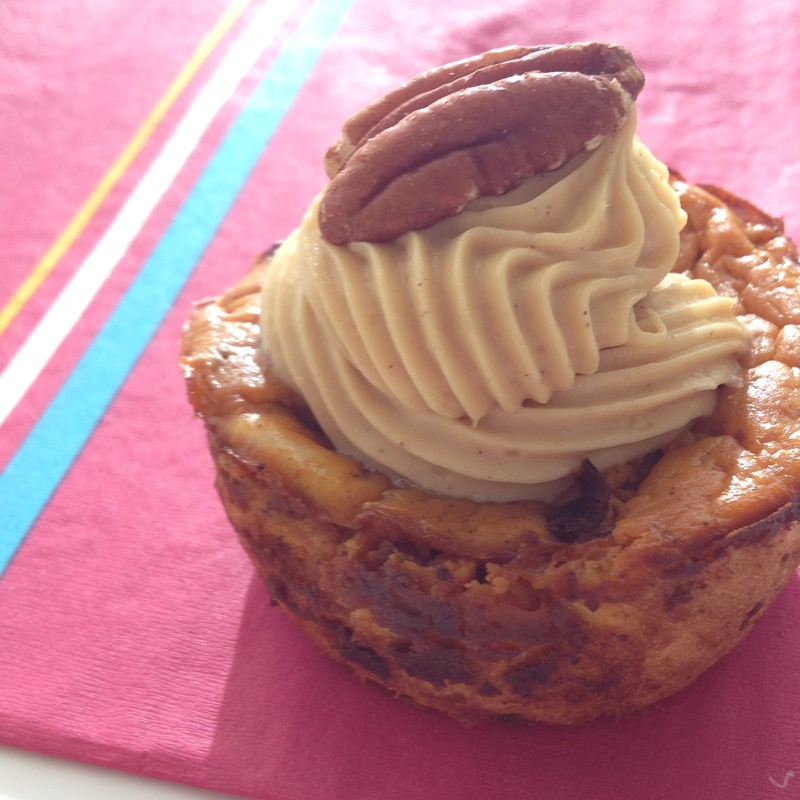 Pipe or spread onto cool pies, and top each pie with a roasted pecan. Note: This ‘frosting’ is incredibly thick. You could add powdered sugar or even softened butter if you want a thinner consistency, but I like it super thick and a little tart. On the seventh day…we baked bread. 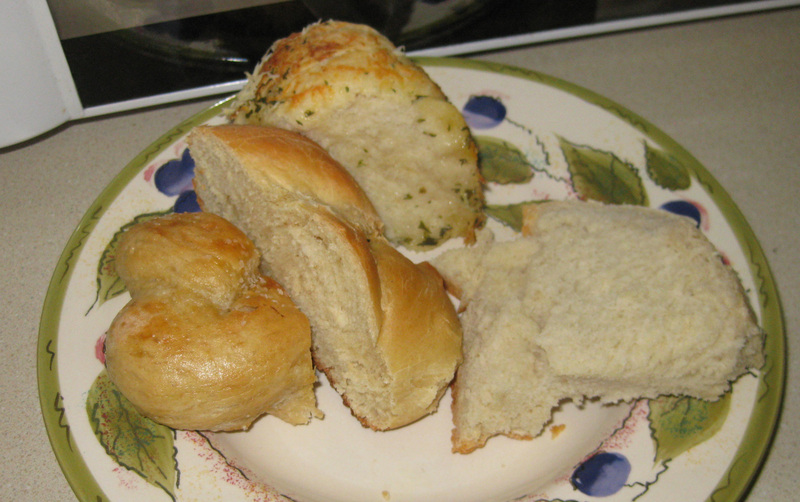 I have a variety of “culinary goals” for the new year, and one of them involved my favorite food group – bread. I. LOVE. BREAD. All of it. Without exception. I bought a bread machine a couple of years ago and it does certain things really well – pizza dough, a good Italian loaf, and it’s great if I don’t have time to wait around. Just pop stuff in, hit go, and I come home to fresh bread. But a lot of the bread recipes I was finding online didn’t take a bread machine into account – and I still wanted to try them. So I picked a Sunday and declared it “bread Sunday.” I knew I needed a partner in carbs (if nothing else, to send the leftovers home with) and my friend Danny said she’d never tried yeast before – in fact, she was a little scared of it. Perfect. Nothing like jumping in with both feet. And she did – well, with both hands, anyway. Because I left my kitchen aid mixing bowl at a friend’s, so we had to knead by hand, which she took on with gumption and determination. She was the kneading queen! She also took all the photos, which are amazing. I couldn’t have asked for a better…well sous chef isn’t the right term. Sous baker? To line up the recipes, I waded through my Google reader and found … 15. Which is…insanity. For anyone. So I decided I had to cut by half. (Because seven – seven is TOTALLY manageable and not at all crazy. Nope. Sanity all up in here.) The assortment was picked for a balance of: ease, inexpensive ingredients, sheer deliciousness, and store cost (as in, I can make it FAR cheaper than I can buy it.) 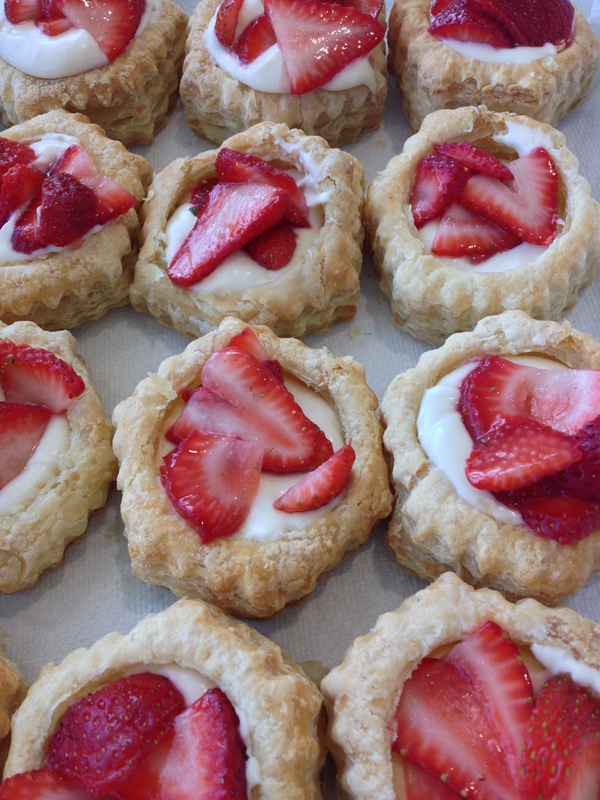 Seven breads (well, six and a scone) made the list. The fact that we got a picture of this before we ate it is a miracle. Results: HOLY DELICIOUS BATMAN! This was the last thing we mixed but the first out of the oven (no rise time) and we ate them with black cherry berry tea. 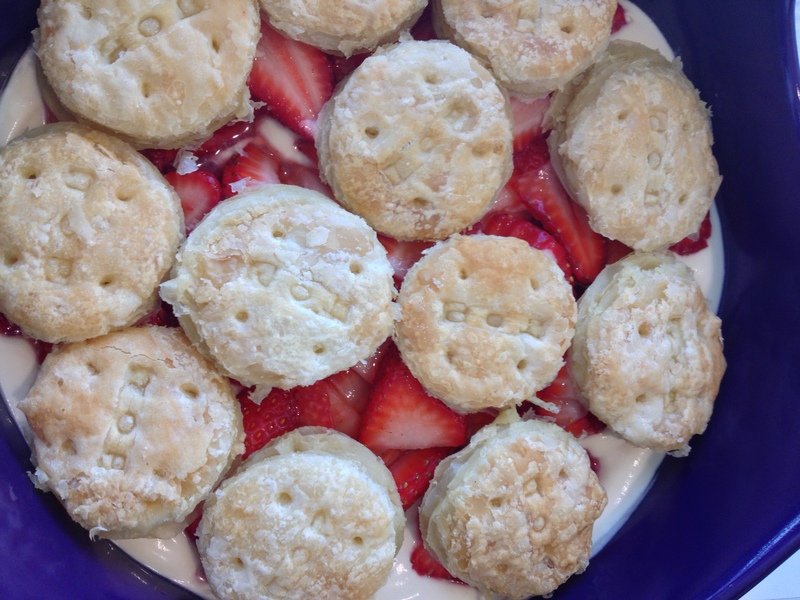 Seriously, drop everything you are doing and make these RIGHT NOW, they will change your life. 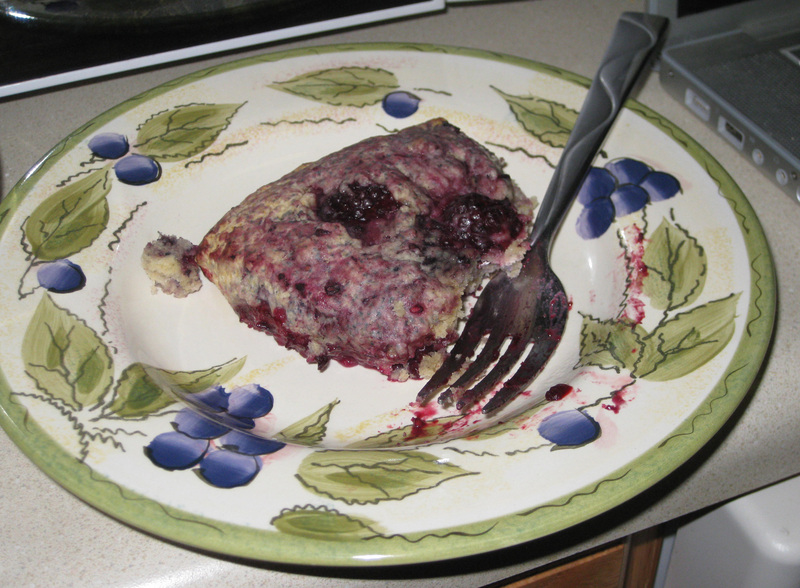 I am glad I “over-blackberried,” though the recipe isn’t kidding about handling the dough as fast as you can – the berries squish fast, even frozen. (And I would not use fresh for this – too messy). The dough was wet, almost too wet – but not quite, because they turned out moist and amazing. 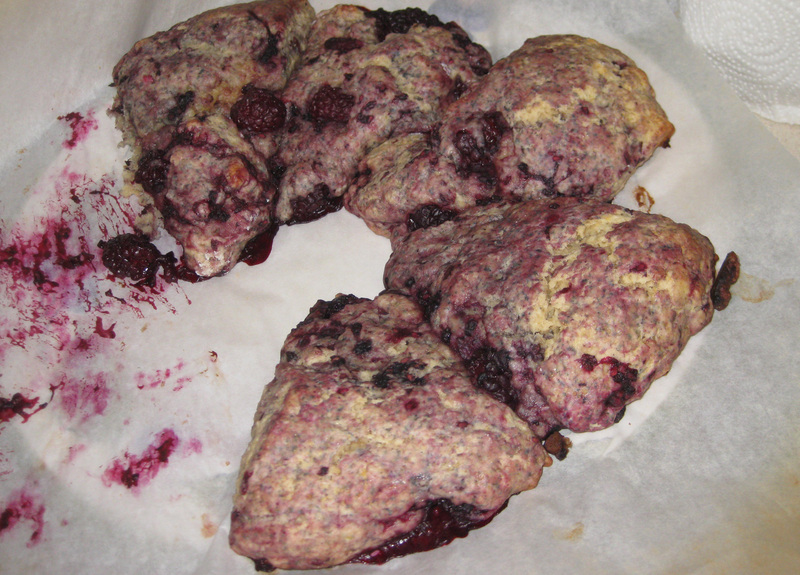 I almost didn’t make these because I thought scones were dry. Not so friends, not so. I feel like you could do an egg wash with a bit of raw sugar on the top to “fancy” them up, but they were a great balance of fresh tasting and not overly sweet – just enough to be good without being “dessert-like.” The whole wheat would be a nice addition to this (had I actually bought some) and I wonder about replacing the cream with skim milk (just to see how much of a taste difference there would be.) Basically, I want to know how to make these healthier so I can eat them EVERYDAY FOR THE REST OF MY LIFE, AMEN. Ahem. Did I mention they’re delicious? Again, the fact the we didn't consume the entire plate in one sitting is nothing short of miraculous. Even though I couldn't find a bundt pan, this blew our faces off. NOM. Result: This was actually the first recipe I saw from this blog (which I now LOVE) and I’ve been eagerly waiting to try it. I was not disappointed. It’s like monkey bread, but savory, and it was AMAZING dipped in our tomato soup. I misplaced my bundt pan, so we did these in a loaf pan instead. I think next time I would try to get the balls smaller, just so that they were more coated, but overall the flavor was out of this world. It was a recipe that took some time (rolling and dipping the balls), but was worth the end result. 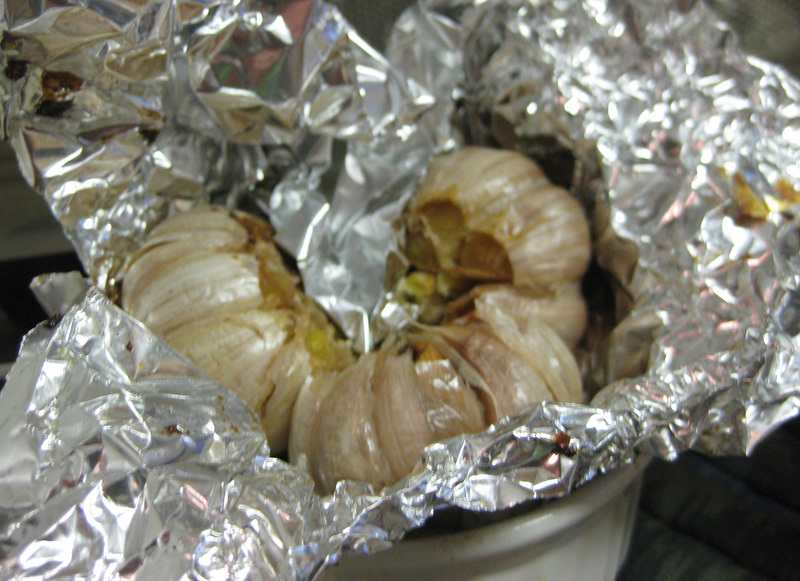 The amount of garlic used would ward off an entire coven of vampires. Even the sparkly ones. Results: This was the bread I was most looking forward to eating, because ciabatta is my favorite bread. (An important distinction, given my love for the species as a whole.) And it’s always insanely expensive in the store, so I thought learning to make it at home would be fantastic. It required a starter, so I mixed that up the night before. (Danny’s reaction to the starter – “That looks disgusting.” She’s not wrong. It looks like you’re throwing some kind of bubbly beige swamp mass into your bread.) Overall it was…good. But not earth-shattering. I think I probably rushed the rising process (not letting it rise for the full length of time). I probably should have waited to mix in the add-ins until the second rise (I did it all in one fell swoop, in the beginning). Next time, I might double the yeast (my solution to all rising problems. Patience is not one of my virtues.) The flavor was there, but the texture did not come out all “bubbly” and airy like a good ciabatta. 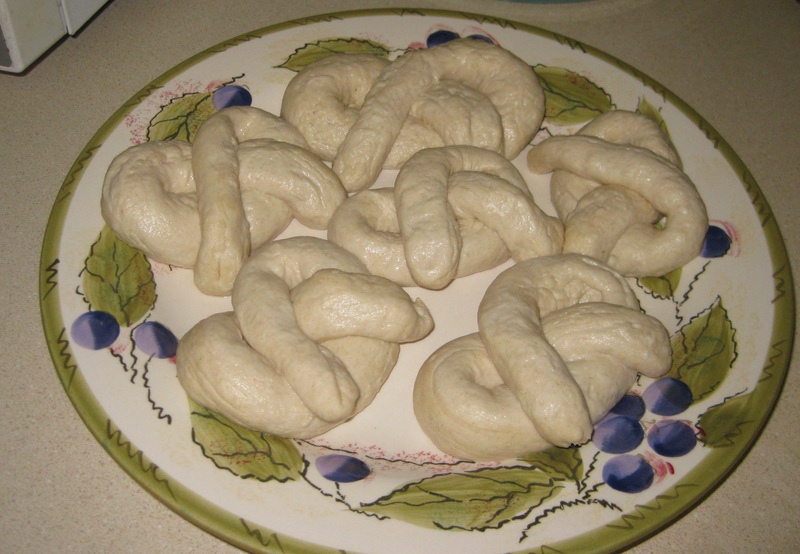 The pretzels before they went into the oven. Danny has some mad crazy braiding skills. Result: It worked! No seriously, I did not think I could actually make a soft pretzel. I mean, who does that? But these were super easy to mix up, only took a half an hour to rise (with the right amount of yeast, even!) and the only time consuming part was twisting them. Which Danny did. Because she’s the artist. 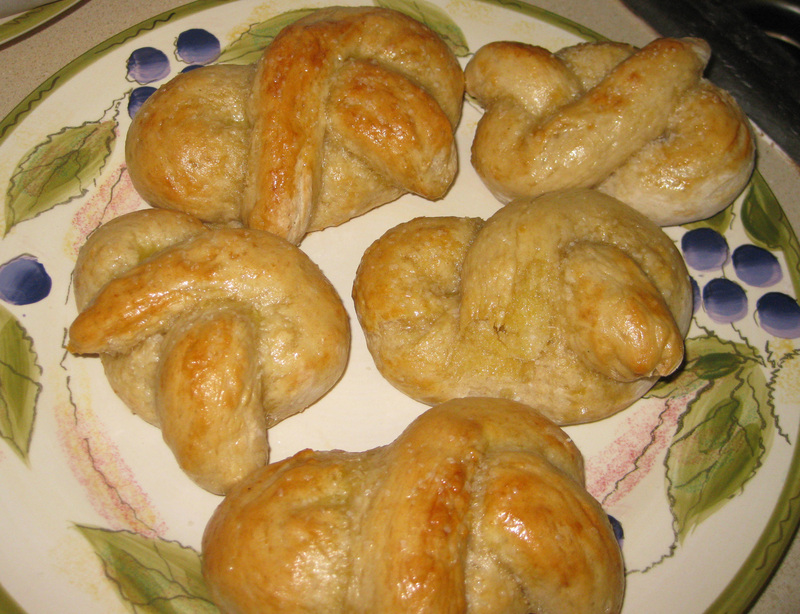 (Also see the beautifully braided challah bread below. Seriously, the woman has mad bread-shaping skills.) They did cook a little longer than seven minutes, but I think that’s because we thought they were supposed to brown in the oven. Note: they don’t. Pull them out at seven minutes and brush with the butter – that’s where the color comes from. They will look underdone. They are not, promise! Also note: These are best the day of – they go stale really fast. So pretty when they're done! And so tasty too! The bread was lonely, and I had to break up the party. Results: I actually made this bread for Christmas and stuffed it (recipe for that coming), and I doubled the yeast because I needed it to rise super fast like. Technical term. And it was so soft, fluffy, and delicious, I kept the idea for this! The dough does require a bit more hands-on work (kneading every 10 minutes for an hour) but overall, this is my favorite basic bread recipe of the bunch. It was moist, soft and just generally amazing bread. The kind that is perfect with a titch of butter and nothing else. I would almost try it with half whole wheat flour next time, just to see if I could healthy it up without sacrificing anything in texture. 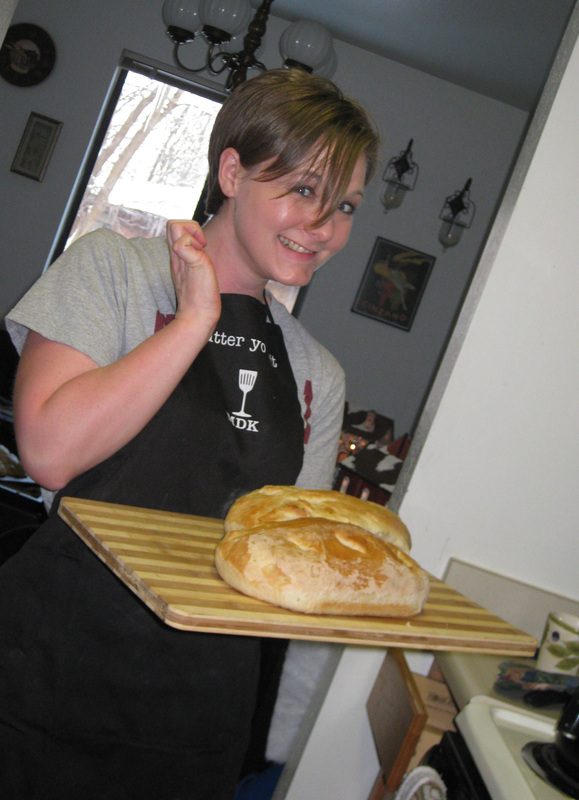 That would be my "this is the first bread out of the oven, please let the rest of them look this pretty" face. Just to cast aside doubt, it WAS as good as it looked. And again, Danny shows her artist skills through dough. Results: Mmmmmmm. This was the one Danny was most excited to try, and it did not disappoint. She did forgo the six-strand braiding method and just did three-strand for the second loaf, which was far easier and still looked stunning. We weren’t sure this was going to rise fully, but it did in the end, and got even bigger on the second rise and in the oven. I put it on the back burner, which gets heat off the oven, so the bottom of the dough actually cooked a little – oops! Danny just pulled that part off and kept going. This is the prettiest bread we made, and it was tasty too! 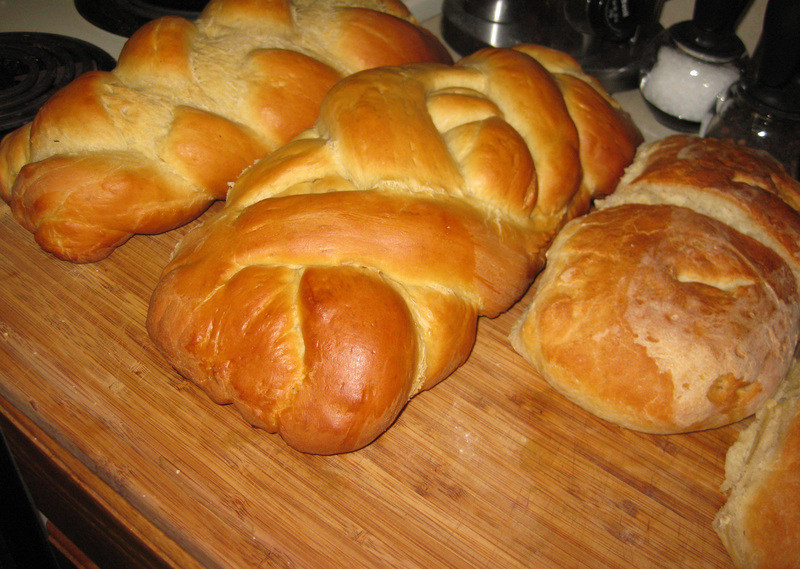 Challah is a sweet bread using eggs and more sugar than normal, so it’s good in desserts and breakfast especially. I plan on using it to make french toast this weekend. Modifications: I only made half the starter (because I didn’t need seven loaves of just sourdough, are you kidding?) and used it all. Results: Mercy alive, it worked! This was another starter bread, which I made the night before, and therefore made me nervous. As it turns out, no need! The crust was SUPER thick (on purpose) and once it rose, I just kind of plopped it in ball form on the stone and just let it go. As it turns out, that’s all you need to do. Another expensive bread made easy. The only issue I had was the sour level – I could have used more, as I like a really sour sourdough. I don’t know if that means letting the starter sit longer or if I need more of something, so I’ll have to look into that. Overall, minus the starter fear and make ahead, this was definitely one of the easier breads to make. Scorecard: All of these breads were great and I would make them again – in fact, I really want to try the ciabatta and sourdough again to see if I can get the starters right. 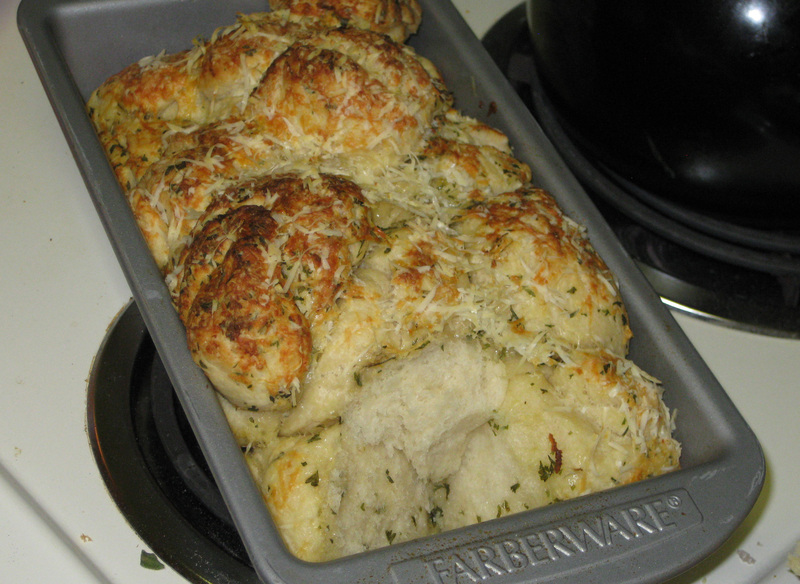 The ballpark hit was obviously the scones, and of the ‘actual’ bread, I would say the pull-apart won. Time wise? 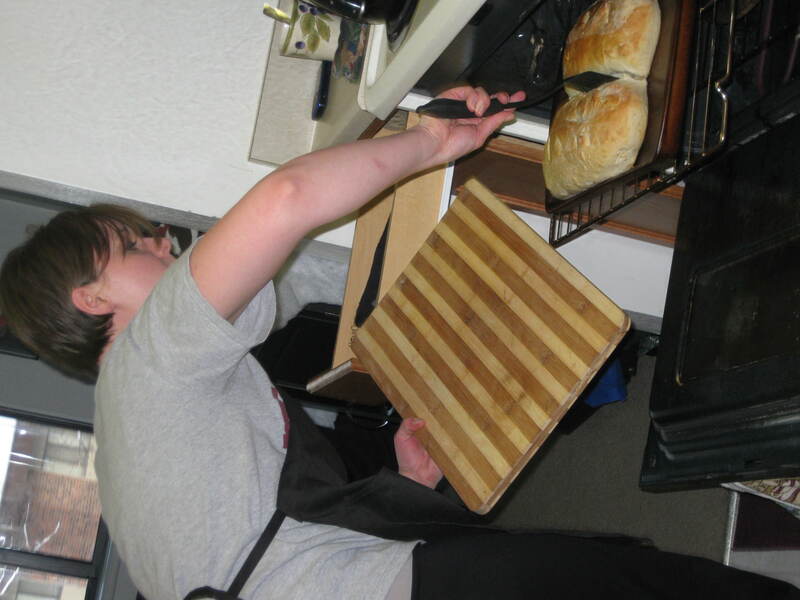 We got started around 2 pm and had the last bread in the oven by 5:30 pm – I was shocked. 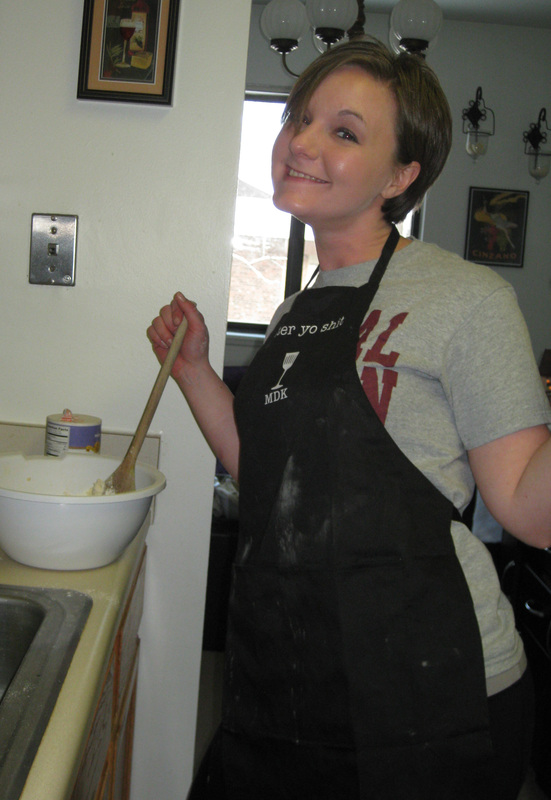 Having two people helped a lot, as Danny would knead or braid while I mixed. But then, how many people actually make seven kinds of bread in one day? I did freeze the loaves that I couldn’t eat right away (and sent Danny home with a bread store). This was a super smashing success in my book, and we’re already plotting which food group we’re tackling next. This is me, before I realized how much Zumba I would need to burn off all the carbs.